In honor of my uncle’s 40th birthday on Sunday, his wife asked me to bake cupcakes for them to take to church as a surprise celebration for him. Ken isn’t much a of a sweets eater, but when it comes to that side of the family nothing says birthday like German Chocolate Cake. My grandpa and my dad both request German Chocolate Cake on their birthday (which happens to be the same day), so I figured this traditional cake would be a crowd pleaser for such a momentous occasion. And since cheesecake is Ken’s favorite dessert, I made Double Chocolate Cheesecake for the smaller birthday celebration Sunday evening. 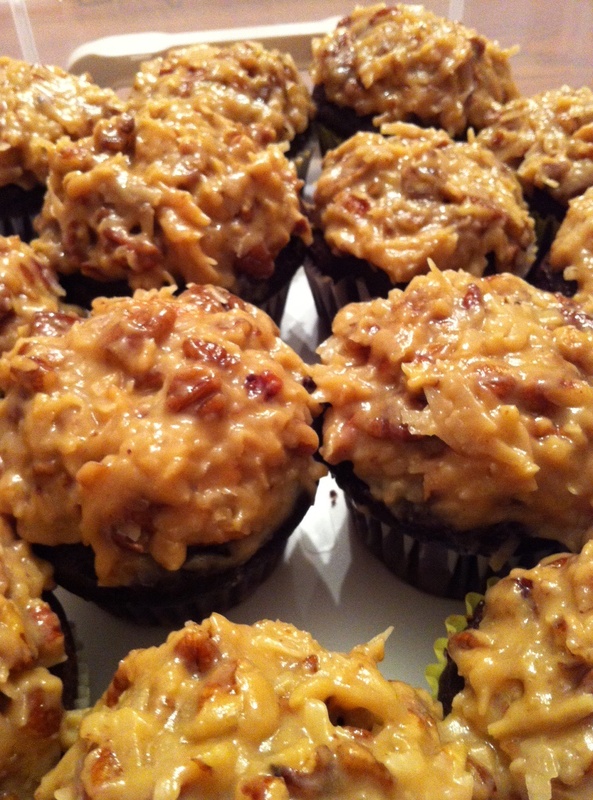 I tried out a new recipe, instead of using the recipe on the inside of the Baker’s German chocolate packaging. This cake tasted more like dark chocolate and my dad claims the frosting tasted “lighter” than usual, but I thought it tasted pretty spot on. 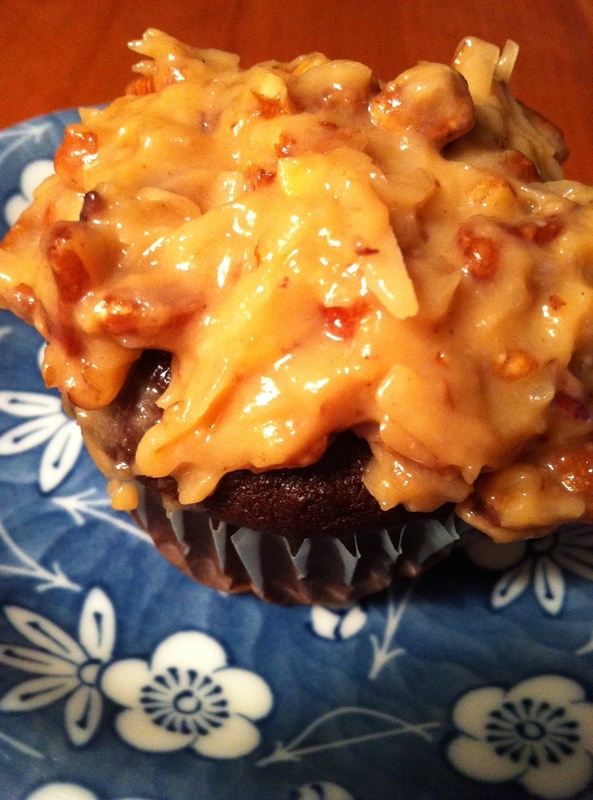 I’d definitely make these cupcakes again. Preheat oven to 350°. Line cupcake pans with liners. In a large bowl cream together the butter and sugars on medium-high speed for about 5 minutes, until light and fluffy. Beat in the eggs one at a time, then beat in the vanilla. In a separate bowl or large measuring cup, whisk together the buttermilk, sour cream and coffee. Alternate mixing in the buttermilk mixture and the flour mixture into the creamed butter, beginning with buttermilk and ending with flour. Be careful not to overmix, but make sure you get everything mixed in from the bottom. Divide the batter into the cupcake tins. Bake for 15-20 minutes or until a toothpick inserted into the center comes out clean. Allow cupcakes to cool in the pan for about 10 minutes before removing. Allow to cool completely before frosting. Melt the butter in a saucepan over medium heat. Stir in the milk, sugar, egg yolks, vanilla, and salt with a wooden spoon. Allow mixture to get just to boiling point, stirring constantly. Reduce heat and simmer 5 minutes until thickened. Mixture should coat the back of the spoon. Strain the mixture through a fine mesh sieve into a heatproof bowl. Stir in the coconut and pecans. Allow to cool at least 1 hour before frosting. Place in the fridge if needed to speed the cooling process.